Let’s be honest; without an RV thermostat to control your RV’s furnace and air conditioner, the inside of your RV would be borderline unbearable. If you don’t believe me, ask the poor souls who had to endure a thermostat quitting on them. I mean, can you imagine riding around or sleeping in your RV without being able to control how heat or cold it is inside? Honestly, I think that would be one the worst experiences you could face as an RV owner. While you probably don’t think about your RV thermostat’s performance that much, it’s essential you have the best RV thermostat available to ensure these nightmarish circumstances don’t come apart of your life. And this article will give you all the information you need to ensure you do have a high-quality RV thermostat. In fact, we’ll even provide you with detailed product reviews of top rated RV thermostats available to make sure you find that fits your RV lifestyle perfectly. In this section, we’ll give you the detailed product reviews we promised above. And with these product reviews, you’ll start to understand what you’re looking for in an RV thermostat. Our first product, Dometic Heat/Cool Analog Thermostat, comes from a company known to produce high-quality products. In fact, they’ll be on this list multiple times, and this particular thermostat doesn’t do anything that hurts their reputation. For instance, even though this thermostat is an analog model, there isn’t a lot of complaints about its effectiveness. And as someone who relies a lot on customers reviews, seeing so many good reviews kind of washes away my issues with this being an older model. Additionally, I love that this thermostat connects to both the air conditioner and the furnace. As you probably know, some models only link to the furnace, which isn’t ideal for someone like me who values convenience. And as someone who loves convenience, the easy to install aspect of this thermostat is a really nice touch. I’d probably still opt for hiring a professional to install this thermostat, but I’d like that the option is there for another RV owner who’s a little more equipped for this mechanical stuff. With this in mind, it just feels like Dometic tried it’s best to make an outdated concept like an analog thermostat into a useful product that is the best an analog thermostat could be; and they succeeded. Moreover, they accomplished this goal without making it unreasonably priced. All of this almost makes up for this thermostat being analog; however, I’m just not completely sold. Honestly, I don’t feel comfortable buying a product like this without all the features the other types of thermostats provide. And lastly, this analog thermostat only fits certain types of RV’s, so, buying this product would require even more research into whether or not it could fit my RV. In the end, this product just isn’t what I’m looking for, but, if you’re bargain hunting, this product could be an intriguing option. The Coleman Camper Thermostat is the second analog thermostat on our list and with that comes an expectation this would be a good bargain option. In this regard, Coleman makes sure they don’t disappoint. I mean, it’s peak simplicity with a high expectation of effectiveness given the overwhelming positivity spreading through the customer reviews. 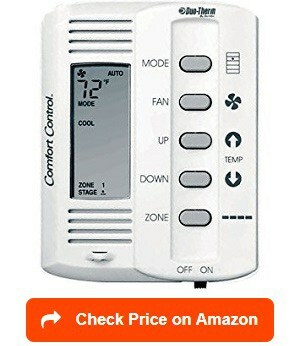 See, it offers both heat/cool control as well as adjusting fan speeds and all at an analog thermostat price. And Coleman, even offers the add-on of an expert installation right on the Amazon page. Therefore, it conveys Coleman is trying to give their customers a sense of practicality that’s unmatched by most of their competitors. With this emphasis put on this product’s practical, you’d probably expect another area like the product’s efficiency to be affected. Well, it’s not because, as mentioned before, there aren’t many complaints in the reviews. After a while, even I, someone who isn’t a fan of analog thermostats, was considering getting one for my RV. 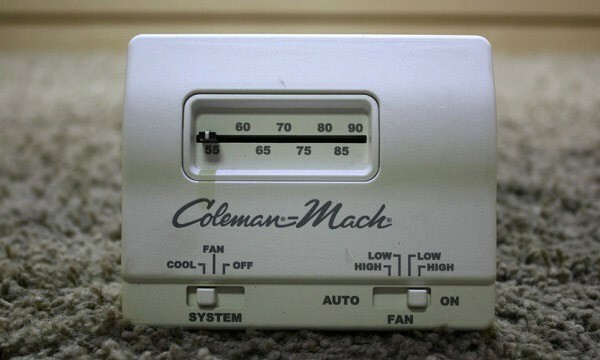 Honestly, there’s nothing Coleman could have done better with building this analog thermostat. It’s genuinely a thermostat worthy of any RV owners’ consideration. But, it’s still an analog thermostat, so, I’d pass on buying this product. However, I was almost swayed by this product’s high-quality reputation, and if you’re looking for a bargain, this thermostat should go right to the top of your list. Although there is one last thing that kind of left me feeling uneasy, some customers were a little upset about the warranty policy. See, some had trouble getting hold of Coleman about their warranty and accused the company of giving them the runaround. But I stress this was a small minority in the customer reviews, most of them sang this product’s praises. As dependable as any thermostat on this list, the Suburban 161154 RV Thermostat Heat Only is an extremely user-friendly analog model that simplicity makes endurable. Honestly, there’s no special about this product, but in some ways, that’s what makes it one of the best. 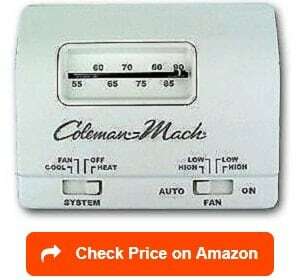 And even though it’s one of the best, it still has the lowest price among all the thermostats on this list. It seems Suburban wanted to create a thermostat that was both cost-effective and efficient to use. With this in mind, I’m here to tell you that Suburban accomplished precisely what it seems like they tried to do. See, this thermostat works just as it’s advertised given the numerous customer reviews saying as much. It’s a nice feeling knowing a product will work exactly how it’s supposed to when buying something as essential as an RV thermostat. Besides being truthful about their product’s capabilities, Suburban also made sure to make the installation as easy as possible. 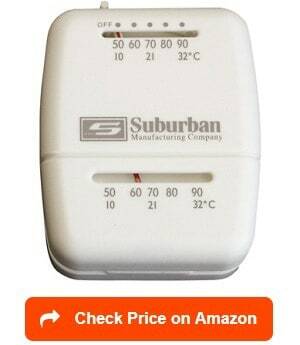 Suburban even offers an expert installation as a part of the package for the thermostat. It doesn’t get easier than this except when you consider installing it yourself doesn’t take much effort either. In the end, there’s a lot to like about this fantastic product from Suburban, but there are some things that gave me a little pause. Unfortunately, this analog thermostat is heat only product meaning that it only controls your furnace and I’m just not comfortable with a heat only thermostat. It’s just not what I’m looking for; I want a model that will control both my air conditioner and furnace. Overall, this thermostat isn’t what I need in mine. But for someone looking for an analog, heat-only thermostat this could be a great option, especially, at this price. 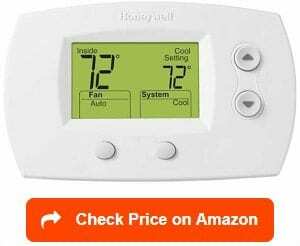 As you might expect from the previous reviews, I’m excited to look at our first non-analog thermostat: the Honeywell Non-Programmable Thermostat. And it helps that our first electronic thermostat is a worthwhile option for any RV owner for a variety of reasons. First, the versatility of this RV thermostat is almost unprecedented among any model. See, this electronic thermostat can work both inside your actual home and RV. For me, this versatility moves this product up to the top of my preferred RV thermostat list. Honestly, with the price of the 2-pack, I could easily afford to upgrade both my RV and my actual home thermostats for the price of some single communicating models. In this regard, Honeywell seems to be ahead of their competitors. Furthermore, it doesn’t lack other features that I would see as essential such as being both heat and cool applicable. As mentioned before, I don’t see the value in buying a thermostat that doesn’t control both the air conditioner and furnace. It just not practical for my circumstances. Along the same lines, this thermostat also offers expert installation, which is a must for me given my lack of talent for dealing with electrical appliances. I mean, I’ve tried to understand these things, but it’s not in the cards for me. Also, since it’s an electronic thermostat, it gives you more control of the actual temperature inside your RV. See, with analog models it’s more like a range, but on electronic models, you can set the room’s temperature to the exact point you feel comfortable. Other than the features mentioned above, there isn’t much more to say. It just seems like a good, high-quality product from a manufacturer that knows what they’re doing. But there’s one issue that popped up on a few customer reviews regarding its longevity. But again, it was only a few instances, and honestly, at these affordable prices, I can see myself buying a two-pack. Our last analog RV thermostat, Atwood Thermostat, comes from a well-represent manufacturer on this list, Atwood. And with this knowledge, you can expect this product to be a very high-quality, no-nonsense thermostat. Therefore, it’s no surprise this thermostat comes with a warranty. After all, Atwood’s a fantastic company that seems hellbent on giving their customers everything they need for a positive experience. In result, you shouldn’t be shocked by how easy this model is to install. Multiple customers reported doing the whole installation in a matter of minutes. I mean, if that isn’t efficient, I don’t know what is; it’s just everything you could want in an analog model. And as you probably expected, it’s incredibly affordable compared to the electronic, programmable, or communicating models. 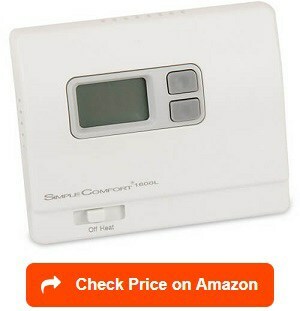 All in all, if you buy this thermostat, you know exactly what you’re getting for a price that isn’t extensive. In the end, there might not be a lot that’s too unique about this product, but one thing it does have is the ability to do its job efficiently. But for me, this product doesn’t work for my circumstances for two reasons. The first being the model type, which does not fit my needs for reasons that I’ve explained extensively in the other analog reviews. And secondly, the heat only feature isn’t right for my RV. See, I have central air inside my RV and need a thermostat that can regulate its use. Unfortunately, this analog model just doesn’t have the necessary capabilities to do so; therefore, I can’t justify buying one. However, if you have a camper that doesn’t have central air and needs a heat-only thermostat, this model could do wonders for you. Our second Coleman product, the Coleman Digital RV Thermostat, is an electronic model that is well-regarded in the RV owner community. In the simplest terms, this thermostat will do its job with little to no issues. In all estimations, this electronic model will do everything an analog model would, but much more efficiently. 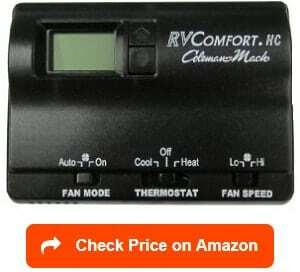 Therefore, I’d recommend any RV owner looking for a simple, reasonably price thermostat to consider this high-quality model. I mean, for me, this model is perfect because it offers the heat/cool feature and the expert install that I so desperately need. Besides those two things, I love how effective it’s at keeping the temperature at the exact point I desire. For instance, this model is known for its ability to turn on the air conditioner or furnace the moment the temperature hits 1 degree above or below your desired temperature. Now, this might cost you a little on your utility bill, but I much prefer this over the 15-degree swings provided by those analog models. And for you RV owners who have the necessary capabilities to install a thermostat yourself, you shouldn’t have any issues with this one unless you’re replacing a non-Coleman product. And that’s one of the two problems I have this thermostat. See, this thermostat isn’t universal; therefore, I implore you to make sure you’re replacing a Coleman thermostat before buying this model. If you don’t, you’ll just end up wasting money and potentially damaging your RV. Also, several customers complained there wasn’t any difference in the fan speeds when you changed from low to high. It’s a little thing, but depending on your RV situation this could have a significant impact on the climate inside your RV. In the end, I couldn’t buy this thermostat because I’m not trying to replace a Coleman thermostat. But if you’re, you should consider this great model. The ICM Controls Non-Programmable Thermostat is a unique electronic model with its lack of ability for linking to AC units. However, it’s a perfect model for RV owners’ looking for a heat-only thermostat. I mean, it’s universally applicable to many different RV’s, so, no one should have a problem setting this up. In fact, I’m confident I could set this one up even with my deficiencies in this area. And while this makes me interested in this thermostat, there was one other feature this product has that really caught my eye. This feature was the sleek design. I know, it kind of looks like a standard thermostat; however, for my RV’s interior, this design would blend in perfectly. Honestly, I wouldn’t notice it was there until I need to adjust the settings. Besides the sleek design, there was another aspect ICM Controls really excels in that kept popping up in my research of this product: customer service. Honestly, it’s rare that you never see a review complaining about the customer service, but in this case, there was none. Instead, you had multiple people praising the customer service, which is even rarer. It’s nice to see a company seems like they care about their customers. And in these same reviews, people were raving about the performance of this product. I wish I needed a heat-only RV thermostat because I’d buy this marvel in a second. And this feeling wasn’t even lessened by some customers complaining about the temperature reading being a little off. Honestly, if the biggest complaint you have is the temperature reading being a little off, I’m confident your RV thermostat is high-quality and worthy of serious consideration. 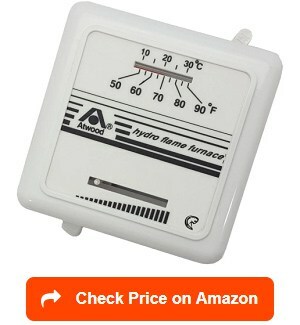 Therefore, anyone with a need for an RV heat-only thermostat should invest in this product quickly. 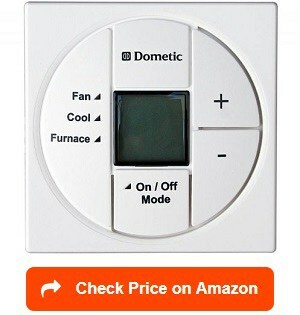 Our first programmable thermostat, the Dometic Comfort Control Center, comes from our old friends at Dometic. With this specific product, Dometic makes sure to throw out all the stops and create my favorite thermostat on this list. And you’re probably asking what makes this one so much different from the rest? Well, all you have to do is program the settings you want once and never worry about your thermostat again; unless you want to change the settings. In fact, not even power failure will mess up your settings because of the internal memory this thermostat has; honestly, it’s amazing the things this model can do compared to some of the analog ones we were looking at beforehand. For instance, with this model, you can create four different climate zones inside your RV at once. Therefore, if someone’s too hot or cold, they can simply set an area inside the RV to their desired temperature. And the incredible features don’t stop with the four climate zones, it can also link to your onboard generator during times of power failure. At this point, I wouldn’t be surprised if this thing cooks your breakfast as well. But as with all cool things, the price is pretty outlandish. However, I think I could justify splurging a bit for a model as unique and advance as this thermostat. And since I need to replace a Dometic thermostat, I think I found the best RV digital thermostat for me. Although, if you’re looking to replace another type of thermostat besides a Dometic, I’m afraid this won’t be the right RV thermostat for you. See, this marvelous thermostat isn’t universally applicable, and sadly you won’t be able to use it along with me. Suprise, surprise; we have another Dometic product on our list, the Dometic RV Air Conditioner Single Zone LCD Thermostat, and it’s not the last one either. And like all the products from this company, it’s a top-notch model. Just like the Dometic Comfort Control Center, this thermostat is also a programmable model, which immediately puts it toward the top of my list. I just love the convenience the programmable models bring their users. For example, this model has three different fan speeds that will allow you to have complete control over the air distribution inside your RV. Honestly, with this model, I’m fairly confident you won’t ever have an uneven room temperature again. In fact, Dometic made sure of it by including an auto fan mode that will vary between speeds to ensure the desired room temperature is maintained. And they also added a large LCD display that is incredibly easy to see and use effectively making this model extremely user-friendly. And last but certainly not least on the pro side, Dometic included a 2-year warranty to ensure their customers feel safe about buying the product. With all these pros, I’d be ready to move this model onto the top of my list, but there’s one issue. 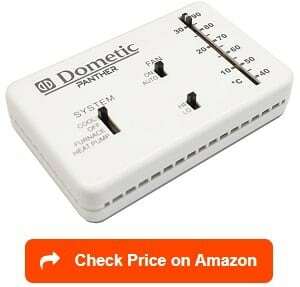 Dometic RV thermostat problems: The price is beyond outrageous for an RV thermostat. I mean, it’s almost double the one before it, and I thought that was pretty expensive. All in all, if you’re willing to spend this much on an RV thermostat, this model should be hands down number one. Also, it’s essential to note that this model only can replace certain other Dometic thermostats. So, it’s critical to do your research before paying this amount of money for something that might not work on your RV. 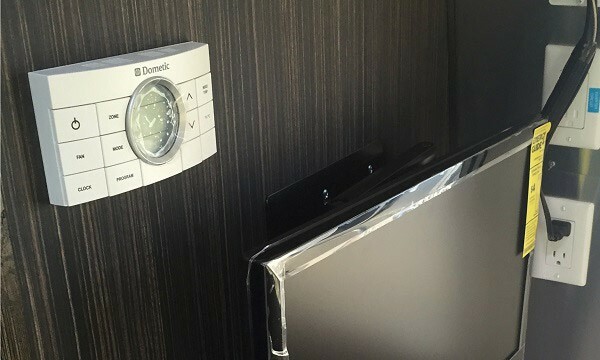 Our last product is another one from Dometic, the Dometic Duotherm Thermostat Control, and like its two predecessors, it’s a programmable RV thermostat. Honestly, there isn’t much difference between this one and the model before it. However, the subtle differences do make it a little more user-friendly in my opinion than the previous Dometic product. For example, it has a larger LCD display, which makes it incredibly easy to see and use even past the levels of the convenience of the model before it. Also, this model contains a backlight in the LCD display that makes it visible in the dark; a nice touch that I wish the other model had. Other than that, these two models are relatively the same. For instance, both have the internal memory storage, the auto fan, the three fan speeds, etc. But there’s one more aspect that this one has an advantage in, the price. I suspect this must be an older model because it’s still pretty expensive; however, it’s not nearly the price of the previously reviewed model on this list. Also, the reviews for this one are a bit more favorable compared to the previous one. I’m guessing that has to do with the price increase and the reduction of features like the backlight and the small LCD design. 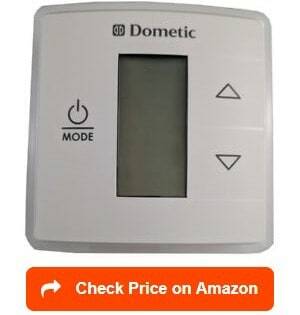 All in all, this product continues the pristine reputation of Dometic products by offering its users a useful and efficient thermostat for their RV. Honestly, you can’t go wrong with any of their products. As you’d expected with any product, there are specific factors you must consider before deciding on the best RV thermostat for you. With this in mind, we’ll cover all these factors and help you decided what you precisely want out of your RV thermostat. Do you want an RV thermostat with Wi-Fi capability? Do you want a setback setting? Or do you want just a standard thermostat that will do its job and not be complicated? Overall, it’s decisions like these that will decide which is the best thermostat for your RV. For me, I’d definitely stay away from the analog RV thermostat and get one of the other three whether it’d be electronic, programmable, or communicating. I mean, I tend to opt for the most up to date option in the products I buy. I just love the additional features these three thermostats offer. However, I’m a little weary of the communicating ones because the technology is so new; therefore, much more expensive and why you won’t see one in our product review section. But if you less impressed by features like these, you might be more inclined to get a simpler version. And honestly, these versions won’t hurt your bank account as much as a souped-up RV thermostat. Overall, RV thermostats come in a variety of shapes and sizes, but the four main types are analog, electronic, programmable, and communicating thermostats. As you would expect, each one has a scenario where they’d be extremely useful (well maybe not analog). See, analog thermostats are rapidly going out of style for a variety of reasons: effectiveness, appearance, lack of features, and overall convenience. But there’s one area where an analog thermostat is ahead of the curve: price. So, if you’re looking for a bargain and are okay without any features an analog thermostat could be a good option for you. Otherwise, you should stick to the other three types and figure out which one fits you best. For example, if you’re looking for fantastic features, you should look at communicating thermostats. See, these devices will allow you to access your thermostat from any point in your RV. Also, these thermostats usually come with an accompanying app that gives you the option to access your thermostat from outside your RV. However, the technology is relatively new, so, I’d be cautious about getting one of these. But if these features don’t really appeal to you and your just looking for a simple, solid RV thermostat, an electronic thermostat might be more your speed. These models work relatively the same way as analogs but are way more effective at keeping your RV at your desired temperature. And finally, if you’re looking for convenience, but find the communicating thermostats too expensive, then a programmable thermostat is the option for you. With these models, you don’t get all the features a communicating thermostat provides, but with the memory system all you have to do is set your desired temperature once and you’re good to go. As you can see, there’s a lot of options, but once you figure out what you want, it starts to become less overwhelming. For me, I liked getting products that are made inside the United States. It just makes me feel comfortable that there won’t be any issues because of the strict regulations the United States puts on a manufacturer. However, you might not mind getting an RV thermostat that’s made outside the United States. And sometimes, the products from non-US manufacturers, function better and have a less expensive price. All in all, it’s about what you’re comfortable with doing and what model fits your particular requirements. And in my specific case, the manufacturer’s location is a massive deal in whether or not I end up buying a product. Reading customer reviews is the best way to determine whether or not an RV thermostat is high-quality. With this in mind, there’s no reason why you shouldn’t take advantage of these excellent resources. I mean, why wouldn’t you read other people’s experiences about any product your considering? And with these reviews, you should be able to determine if the thermostat does what it claims. I despise when a manufacturer claims its product can do something then it fails to do that very thing: it’s frustrating. Besides quelling you of this frustration, making sure your RV thermostat is high quality also reduces the risk of you having to buy a new one in the future. In fact, a high-quality RV thermostat will likely last a long time on average about 10 years, so, it may be more cost effective to spend more now than buying a whole new later. One of the most critical factors in buying an RV thermostat is making sure the models you’re considering have a warranty. After all, an RV without a thermostat is an absolute nightmare and shouldn’t be a scenario anyone should experience. Due to this, the first thing you should research is the model’s warranty policy. If they don’t have one, strongly consider removing it from consideration; unless the customer reviews make it seem like a well produced product. Honestly, an RV thermostat without warranty says to me the company doesn’t have complete faith in its product. It seems like they’re trying to scam people into buying a fraudulent product. In the FAQ section, we’ll try to answer any remaining question you have about RV thermostats with the intention of finding you the best one for your circumstances. With this guide, we hope your RV thermostat buying experience will be effortless and rewarding. What is an RV thermostat? An RV thermostat is a device that controls the temperature inside your RV by controlling the furnace and in some cases your air conditioner. Therefore, it’s paramount you have a high-quality thermostat to keep things comfortable. After all, you need a way to control the temperature in your RV, especially, if you plan on using your RV frequently. And with the right thermostat, you’ll be able to control the temperature in a way that fits your lifestyle. In the end, an RV thermostat main purpose is to make sure your RV experience’s comfortable and suits your particular needs. Also, you can program certain RV thermostats to make sure you’re not wasting energy. See, unlike the older mechanical models, newer RV thermostats have microprocessors that allow you to both set the temperature while you’re both at home and away. In other words, you can keep things comfortable when you’re at home and set the temperatures back while your out or sleeping. By doing so, these thermostats will save a lot in electricity costs. As mentioned above, in the RV thermostat world, there are four types: analog, electronic, programmable, and communicating RV thermostats. In comparison, electronic RV thermostats work very similarly to the old analog thermostats except their electronic and are very accurate at detecting temperature. See, these models have microprocessors that compare the temperature of the room to the desired temperature you select. Then, they either give start or stop commands to the air conditioner or furnace based on the temperature you selected. Now the next type, programmable RV thermostats, work in a very similar way. However, programmable RV thermostats are much more user-friendly than electronic models because you can program your desired settings into the thermostats memory. Much easier than always needing to change your desired temperature as you would with an electronic model. And lastly, the communicating RV thermostats are the most advanced of the bunch. These thermostats give the user complete control over the experience through a communication system. Therefore, this communication system allows the user to tell the thermostat what to do from any point in the RV. It’s a pretty incredible and convenient feature for any RV owner to have inside their RV. Why do you need an RV thermostat? In general, the main reason you need a thermostat is to regulate the temperature inside your home, workplace, or other space. However, there’s a reason you need a specifically made RV thermostat. See, regular thermostats, such as the ones you find in our home, run off a small transformer, which provides 24 volts to the thermostat. With an RV, you don’t need this much voltage because the RV already runs off a battery. Instead, an RV thermostat runs off 12 volts. In the end, this difference in voltage is the main difference between a regular thermostat and an RV thermostat. But there are other smaller differences between the two that are worth mentioning. For example, an RV thermostat will typically have a high/low fan speed to control the air conditioning/hear inside your RV better. It’s subtle differences like this that make getting a specifically made RV thermostat extremely essential. Where to buy an RV thermostat? As with any product these days, the best place to buy is Amazon. However, there are other online sites that are fantastic providers of these devices. For instance, Campingworld.com is a tremendous secondary online source for buying RV thermostats. And if for whatever reason, you’re not comfortable buying one online, you could also go to your local Wal-Mart or Home Depot. Both these stores should have a reasonable selection at relatively fair prices. Overall, I’d recommend buying one online as the price tends to be a lot lower than what’d you find at your local Wal-Mart or Home Depot. Then, if you’re not comfortable installing it yourself, calling in a professional to do the job for you. As you’ll see in our next section, it’s possible for a regular RV owner to install one themselves, but I implore you, make sure you’re comfortable and actually able to do the replacement such as dometic thermostat replacement or Coleman RV thermostat replacement. See, if you mess the installation up, it could damage other parts of your RV and end up costing you more than a professional installation would cost. So, it might end up being more cost-effective to pay for the professional installation regardless. 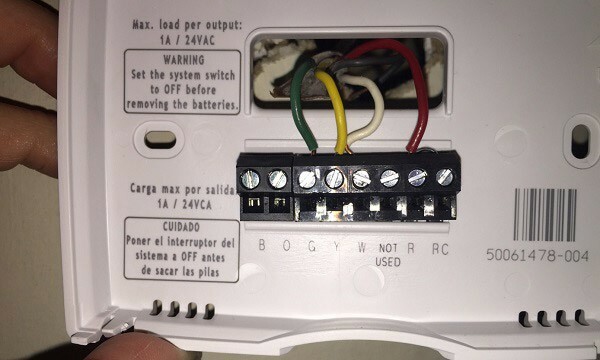 How to replace an RV thermostat? Well, it depends on the model you plan on getting. However, here’s a great write up on hunker.com to give you some idea about what it will generally be like. Honestly, I’d still opt for getting a professional to do the installation. It just isn’t worth the hassle or the damage that a mishandled RV thermostat installation could do to your RV. And finding a professional isn’t that hard to do; simple, type “thermostat installation” into Google and find the best-rated professionals in your local area. However, if you think you’re capable, it can be pretty cost effective to do it yourself because an RV thermostat wiring installation can be expensive. As a result of being more comfortable with all things RV thermostat, there’s no reason you should be stressed about upgrading/replacing your old one. In fact, with all this new information, I classify you as an expert on this subject. Now, all you have to do is figure out what exactly you want in an RV thermostat and find the best RV thermostat for you. Maybe it’s even one of the ten from our product review section! We would like to thank you for reading this article. Find out more about how to choose the best RV air conditioners, best RV roof vent fans, best RV vacuums and best RV grills with our reviews and ratings. Furthermore, please take a look at the best RV dehumidifiers, best 12 volt refrigerators, best RV washer dryer combo and best RV heaters, to buy the best one for your RV appliances, heating, ventilation and air conditioning.